Oh my goodness. First William Shatner, and now this? 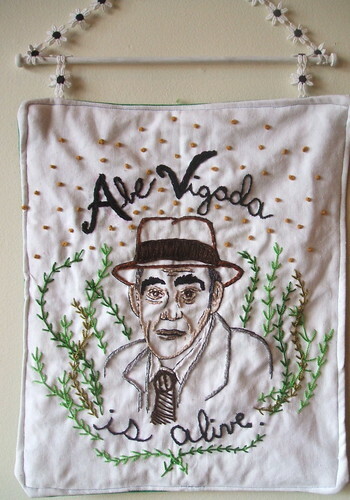 Abe Vigoda was SO my favorite curmudgeon on Barney Miller. I just wanted to hug him. Awesome work, Ms. Virbitsky! And of course, these embroidered portraits bring to mind the amazingly talented Ms. Hart. I finally saw a few of Jenny's portraits in person last week and I almost passed out from their sheer amazingness. Keep the portrait spirit alive, peeps! She is making me want to try this and do Frank Sinatra or Dean Martin. oh my gosh - this is so funny. I liked him too!